The abuse was measured over a six-month period. Diane Abbott’s testimony during a recent parliamentary debate about intimidation against members of parliament (MPs) was the first time many people heard the extent of sexist and racist abuse facing women in UK politics. But for women MPs who are active on social media platforms, these harmful encounters are something they must contend with daily. At Amnesty, we’ve been investigating the extent of online abuse against women MPs active on Twitter in the UK through individual interviews and by using machine learning to detect abusive tweets sent to women MPs. The findings outlined in this post provide a detailed look at abuse on Twitter in the run-up to the 2017 election — in which Diane Abbott’s case stands out for all the wrong reasons. The online abuse she and other women MPs experience sits in a wider context of pervasive and damaging attacks against women from all walks of life on social media platforms. For the last eight months I’ve been speaking to journalists, activists, bloggers, comic book writers, comedians and women active in all levels of politics and public life to hear about their experiences of abuse on social media platforms. I’ve had numerous long chats with women in cafés, parks, hotel lobbies, at youth centres or via Skype, and each time I hear the same message. Twitter can be a scary place for women online. Whether women use social media platforms as public figures or for personal use, the threat of abuse is all too real and it is having a silencing effect on women’s participation online and in the public sphere. While online abuse is certainly not limited to women in the public eye, women politicians face an extraordinary amount of abuse on social media. To understand just how much abuse women MPs face online we worked with a data scientist to analyse a sample of Twitter data from 1 January to 8 June, with a focus on the six weeks prior to the 8 June UK election. We wanted to understand how many of the tweets sent to women MPs were abusive, whether some MPs were targeted more than others and if there were trends in such targeting. We also wanted to use Twitter’s own data to demonstrate the scale of online abuse and to show how discrimination against women doesn’t just disappear when you move into the digital world. Gender inequality in society exists both online and offline and people of all genders can experience online abuse. However, deep rooted and negative gender stereotypes against women also influence the way some individuals communicate online. This means that online abuse against women is often sexist or misogynistic in nature, and online threats of violence against women can be sexualized and usually include specific references to women’s bodies. Our sample of 900,223 tweets between 1 January and 8 June was drawn from social listening tool Crimson Hexagon. Crucially, because we could only download historical Twitter data, our sample did not include tweets that have been deleted or tweets from accounts that were suspended or disabled. We made multiple requests to Twitter for access to a full data set covering the period of analysis but our requests were refused. This means we can only assume the true scale of abuse facing women MPs was even higher than our results show. It is also important to note that any automated or semi-automated data analysis is imperfect. Further information on the figures used in this study can be found at end of this post including a link to our full methodology. Interviews with women MPs also highlight the serious psychological impact of online abuse. Overall, our study demonstrates just how much more work needs to be done by social media companies and governments to tackle this ever-growing problem. Earlier this year, Amnesty International hosted a Hackathon with Accenture Digital during which participants were tasked with quantifying and analysing abuse against women MPs online. Over the two days, the high levels of abuse against Diane Abbott in the data set was flagged by almost every group of participants at the event. With these early findings, we were keen to find out whether a dedicated data scientist applying a more fine-tuned and tested methodology to the same data would produce a similar result. The detailed analysis confirmed these initial findings. 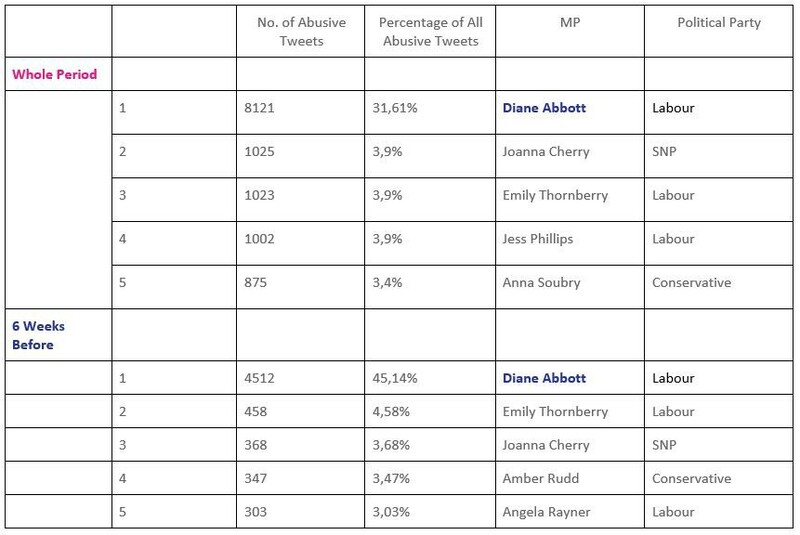 In the six weeks prior to 8 June, Diane Abbott received almost half or 45.14 per cent of all abusive tweets against women MPs included in our study. For the total period of analysis between 1 January and 8 June she received 31.61 per cent or almost one-third of all abusive tweets. Not only did she top the list of MPs for most abusive tweets but she received 10 times more abuse than any other woman MP in the run-up to the Election and eight times more abuse than any other woman MP during the entire period of analysis. 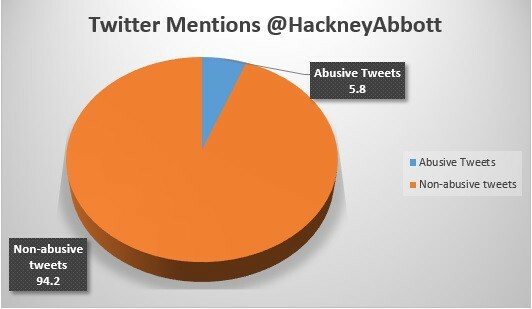 Our findings show that 5.8 per cent or 8,121 out of 140,057 of all tweets mentioning @HackneyAbbott were classified as abusive. 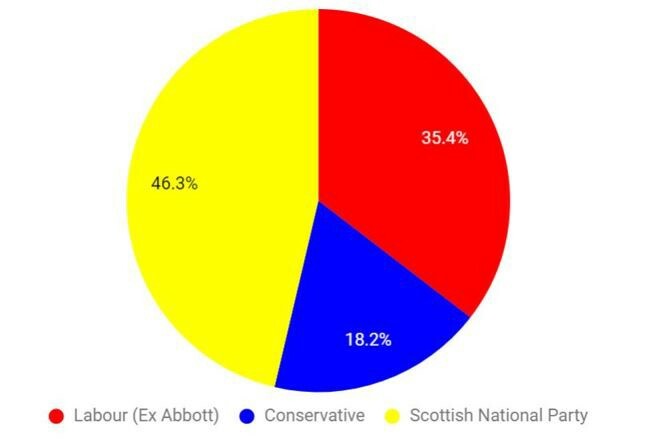 This means that Diane Abbott alone received more abuse during the total period of analysis (1 January to 8 June) than all women MPs from the Conservative and Scottish National Parties combined. As the first black woman MP elected into Parliament, Diane Abbott is no stranger to targeted abuse. Thirty years after she was first elected, we met in her Westminster office, a small room overflowing with books and policy folders. On her desk, in between stacks of papers sits a framed photo of her with Nelson Mandela. Diane explained to me the difference between the abuse she faced back then and the abuse she faces now. She also described what she believes to be the difference between genuine political debate or even criticism of her policies and the online abuse that she receives on a daily basis. The combination of racist and sexist abuse received by Diane Abbott is reflective of a wider trend of "intersectional discrimination". That is, discrimination that targets an individual on the basis of their different identities. Any analysis of online abuse against women should not be limited to only applying a gender lens to the data. When you are a woman with multiple or intersecting identities, your experience of the world is not just limited to your gender. Your race or disability or sexual orientation, for example, can have just as much of an effect as your gender — if not more — on how you are treated both in the physical and digital world. In the case of online abuse, women of colour, religious or ethnic minority women, lesbian, bisexual, transgender or intersex (LBTI) women, women with disabilities, or even non-binary individuals who don’t conform to traditional gender norms of male and female, will often experience abuse that targets these different identities. 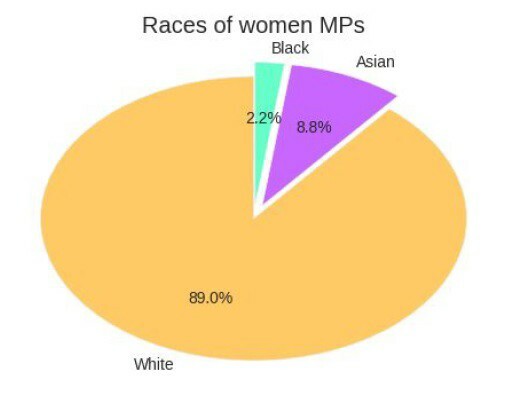 Diane Abbott standing out in our analysis is an acute example of how intersectional discrimination works. The abuse that she faces is not just sexist and misogynistic; it’s also incredibly racist. For example, she recounted to me the response she received after she spoke about her experience of online abuse in a recent parliamentary debate. Our findings demonstrate intersectional online abuse against women MPs in more than one way. Despite representing only 8.8 per cent of women MPs in Westminster, Asian women MPs were found to receive the most abusive tweets per MP. Our analysis shows that Asian women MPs receive 132 abusive tweets per MP. This is 30 per cent higher than white women MPs who receive 92 abusive tweets per MP. 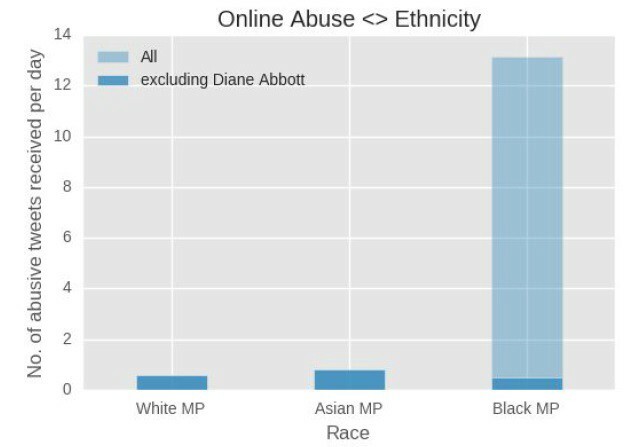 Given the disproportionately high levels of abuse against Diane Abbott, black women MPs were found to receive 2,781 abusive tweets per MP — but when Diane Abbott is excluded from the analysis — the findings show black women MPs receive 81 abusive tweets per MP. Earlier this summer I spoke to Tasmina Ahmed-Sheikh, a former MP for the Scottish National Party and the first Black Asian Minority Ethnic (BAME) woman from Scotland to be elected to any Parliament. Her Twitter account was also included in our analysis. Tasmina explained how she began experiencing online abuse during her campaign for the 2015 general election. 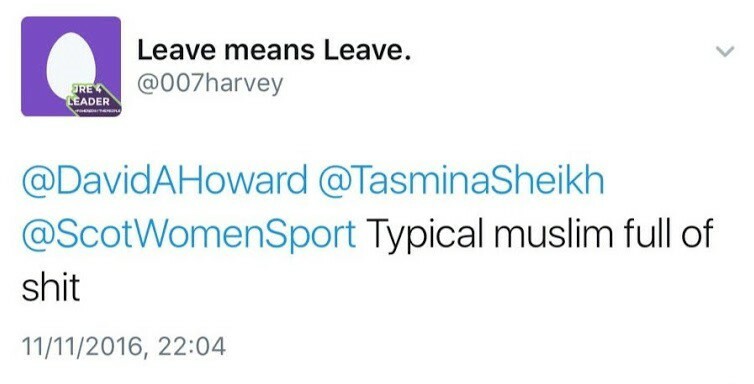 When I asked Tasmina for examples of the type of abuse she faced, she told me that somebody once tweeted her home address and postcode, which then required police to patrol her house. The police have also advised Tasmina to designate a safe room in her house where her family should meet in case a threat made online should transpire. She also recalled a pile-on of abuse she received after appearing on BBC Question Time in November 2016. Although our findings highlight the intersectional nature of online abuse against women MPs, it’s important to recognise that online abuse affects almost all women MPs and cuts across political party lines. Our analysis found that 2.85 per cent of all tweets sent to women MPs between 1 January and 8 June were identified as abusive, amounting to a total of 25,688 abusive tweets out of 900,223 total tweets. Online abuse against women MPs on Twitter almost doubled in the run-up to the snap election with the days leading up to the election seeing the highest levels of abusive tweets at 5.03 per cent in June. Online abuse also cuts across political parties. Below is a breakdown of political party representation of women MPs in the UK as well as online abuse by party affiliation. Since the disproportionate amount of abuse received by Diane Abbott skews the results, with her included Labour receive by far the most abusive tweets per MP. 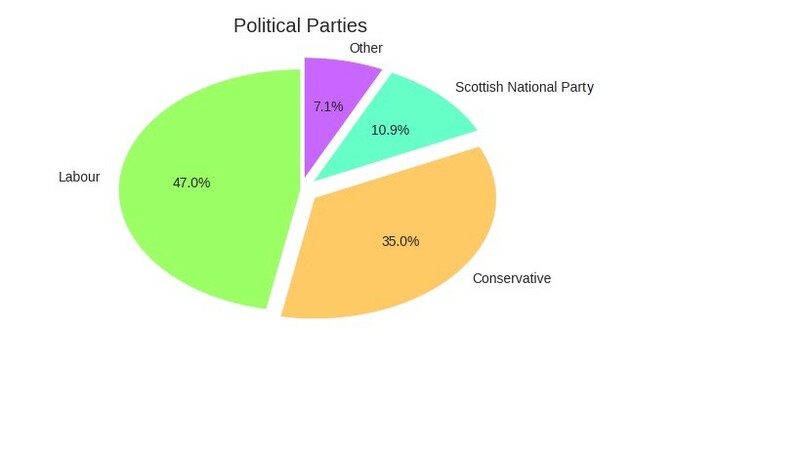 However, if excluded, SNP party members received the most abuse, with SNP women MPs receiving almost half of all abusive tweets in our study. Although the levels of abuse may vary across political party and individuals, our findings show that no political party is immune to online abuse against women MPs on social media. The cross-party nature of online abuse is further demonstrated by the fact that women MPs from the three largest political parties are represented in the Top 5 List of Most Abuse Received on Twitter. 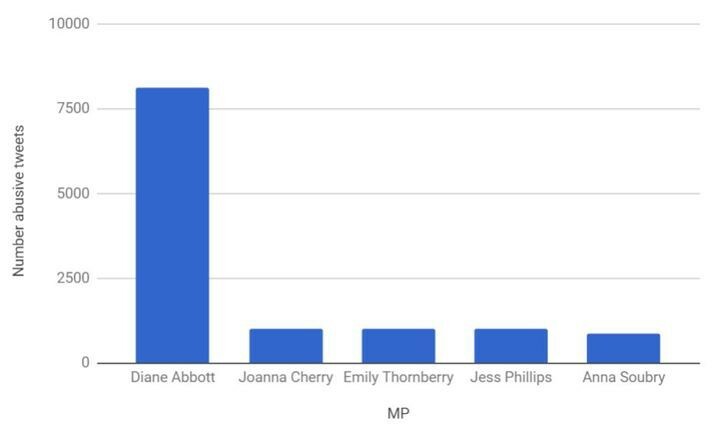 Diane Abbott along with Emily Thornberry (Labour), Joanna Cherry (SNP), Amber Rudd (Conservative) and Angela Rayner (Labour) made up the five women MPs receiving the most abuse in the six weeks prior to the snap election. Jess Phillips (Labour) and Anna Soubry (Conservative) also both topped the list for the highest number of abusive tweets during the wider period of analysis between 1 January and 8 June. For many individuals, social media platforms have now become the medium of choice to express abusive behaviour. Some people may think that online abuse is ‘less real’ than offline abuse, that online abuse can be easily ignored, or that women can simply ‘turn off’ these platforms — and by extension choose to stop receiving abuse. However, these responses not only deny women their right to freedom of expression, they fail to recognize that ‘turning off’ is not always an option for women who wish to (or need to) stay engaged online. “Social media is hugely important tool… from a politician’s perspective or from anyone’s perspective who wants to get information out in public domain, it’s a great, great way of doing it”. Nevertheless, online abuse or even the threat of it can drive women off platforms like Twitter and have a chilling effect on women speaking out online. Ensuring that everyone can participate freely online and without fear is vital to ensuring that the internet promotes freedom of expressionequally. Otherwise, the risk is that women will self-censor themselves online, refrain from engaging on certain subjects or in political activism, or will choose to leave social media platforms altogether. When I first asked Diane Abbott about how online abuse has personally impacted her, she did not immediately open up and spoke instead about the negative impact on her staff who often deal with the large volumes of abuse she receives. However, after a long pause, she admitted: “Online abuse does damage you, it damages your confidence and it corrodes your self-esteem”. Tasmina Ahmed-Sheikh was emotional as she opened up to me about the implications of receiving torrents of abuse online. “[Online abuse] is very difficult and very upsetting. It has been really difficult for me to deal with because I’ve sat and I have wondered why I am doing this and my family wonder why I’m doing this. Twitter themselves acknowledge this. In 2015, Twitter announced its plans to get tough on online abuse, with the company’s General Counsel, Vijaya Gadde, declaring in an op-ed that “freedom of expression means little as our underlying philosophy if we continue to allow voices to be silenced because they are afraid to speak up”. And yet this is exactly what is happening. Online abuse flourishes on the platform, making it a toxic space for women. A recent study published on 22 August by the Fawcett Society and Reclaim the Internet reviewed a range of abusive and violent content on Twitter which was then reported to the platform by anonymous accounts. However, one week later, the reported posts remained on Twitter and the accounts which reported the abuse received no further communication from the platform. 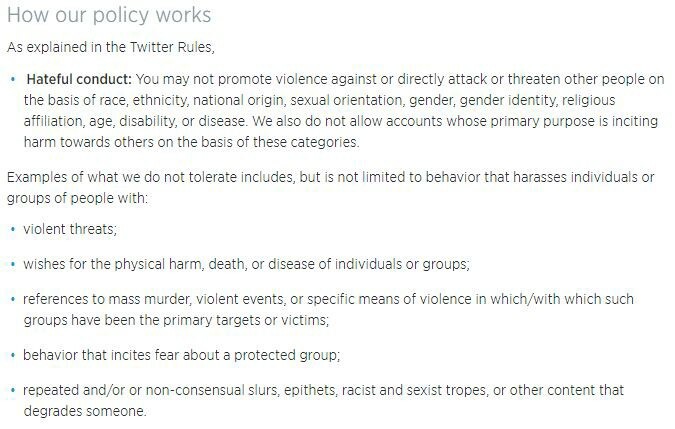 Twitter, first and foremost, must enforce its own policies on hateful conduct and abuse. Much of the abuse detected by Amnesty contravenes Twitter’s own Terms of Service and Community Standards. Yet, months later, the abuse remains on the platform. Although the company states that "it doesn’t tolerate behaviour that harasses, intimidates or uses fear to silence another person’s voice", this is exactly what is happening to many women who use their platform, including women in the highest levels of government. In July, Twitter stated that it was now taking now taking action on 10X the number of abusive accounts every day compared to the same time last year. But it’s clear that Twitter needs to invest more resources to enforce adequate and transparent reporting mechanisms that users have confidence in utilising. Training about the various ways online abuse manifests on the platform, including specific attention to gender and other identity-based abuse, should be mandatory for all staff members, including developers, researchers, and especially moderators. The company should also record and publicly share disaggregated data about the levels of abuse and their response. Twitter needs to be transparent about the resources it’s investing into tackling online abuse. The UK government has an obligation to protect women from human rights abuses and has taken some steps to address violence and online abuse targeting women on social media. The Committee on Standards in Public Life will soon hold a hearing about online and offline intimidation of Parliamentary candidates during the 2017 election period. The hearing is part of a Parliamentary Enquiry launched by Prime Minister Theresa May to investigate both online and offline abuse against all MPs and other standing candidates. The enquiry presents an important opportunity to call on social media companies to increase transparency in reporting mechanisms and in resources dedicated to ending online abuse — particularly online abuse against women — on their platforms. The enquiry must also ensure that an intersectional gender lens is applied to any recommendations which recognizes the different ways that women, and especially women with different identities, experience online abuse. The UK government must also exercise caution. Introducing legal sanctionson companies that fail to remove content are both dangerous and unnecessary. The UK government must commit to tackling the source of the problem and invest in programmes that challenge negative gender stereotypes of women in society which manifests as misogyny and abuse online. The government must also ensure that any response to this issue recognizes that online abuse against women is an extension of existing offline discrimination and abuse against women. A failure to do so will have serious consequences for women now and in the generation to come. Nearly 90 years after women won the right to vote, there is a real danger that the high levels of online abuse against women MPs will have a chilling effect on women taking part in public life — particularly women of colour. This is not only detrimental in terms of the possible long-term effect on the representation of women in politics in the U.K but also continues to deepen societal inequality between genders. Azmina Dhrodia is a researcher in technology and human rights at Amnesty International. This article originally appeared on Medium. Our analysis found that between 1 January and 8 June 25 688 tweets out of 900 223 total tweets were identified as abusive. The true positive rate, i.e. the tweets labelled as abusive by the model that are truly abusive, is around 64%. The remaining tweets are false positives, i.e. not truly abusive. This means that we expect the number of truly abusive tweets within the 25,688 tweets to be 16,440 (= 0.64 X 25,688 ). However, a large number of abusive tweets are not captured by the model. Only about 44% of truly abusive tweets are detected and the rest are false negatives, i.e. tweets not labelled as abusive but are truly abusive. This means that our estimate of the actual number of abusive tweets out of the 900 223 total number of tweets is around 37 364 truly abusive tweets (= 16,440 / 0.44). For the purpose of this publication, we have used the 25,688 figure. You can find Amnesty's full methodology here.